Faster transactions. More affordable operations. More efficient collection. 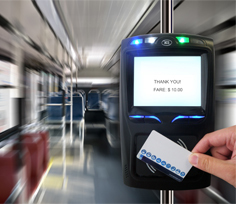 Our transport solution, TapToPay, makes these possible through an automatic fare collection (AFC) system that can cover bus, rail, ferry, road toll, parking, fastfood establishments and convenience stores. An AFC system can increase convenience in a city and improve its image. It can broaden customer bases for transport systems and establishments, because end users would naturally gravitate towards solutions that make their lives easier. All in all, an AFC system makes a city a better place to be. There are multiple components for an AFC system , and we develop all of our technologies in-house. Our system enables users to pay for goods and services city-wide, using contactless technology. Not only does this lessen risks and costs associated with handling cash, it also gives merchants a platform for better record management and leaner, meaner operations. An AFC system generally lends transparency and efficiency to transactions. For further details, please visit www.taptopay.com. Who may put up an AFC system? TapToPay may be deployed city-wide (covering different establishments and forms of transport) or on a smaller scale (covering limited forms of transport). Clients may be from the public or private sector. They range from city planners and government agencies, to transport operators looking to increase efficiency. TapToPay is currently streamlining transportation in parts of Africa, South America and Asia. Email us at [email protected] to find a transport solution that matches your needs.